Water, Onions, Corn, Carrots, Potatoes, Spinach, Coconut Milk, Yogurt, Sunflower Oil, Garlic, Chickpea Flour, Ginger, Salt, Sugar, Chilies, Spices, Turmeric. 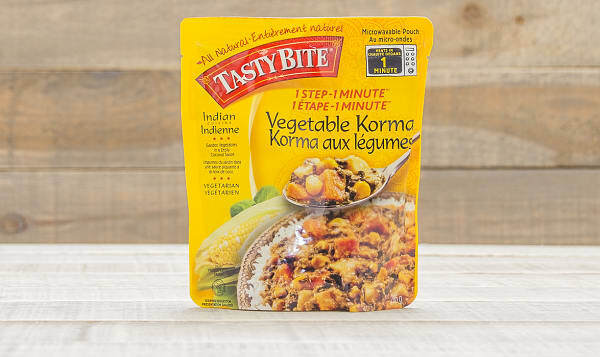 Korma dates back to the 16th century in Indian cuisine, and Tasty Bite is proud to continue the long-standing tradition. They start by simmering a fresh vegetable medley of potatoes, carrots, corn, and onions in a sweet and savory coconut curry sauce. Serve over a fluffy bed of rice for tasty results.